A new poll from YouGov brings exciting and unprecedented news for libertarians. Asked “Would you describe yourself as a libertarian or not?” fully one in five of likely millennial (ages 18-29) voters said yes — thus self-describing themselves as libertarians. 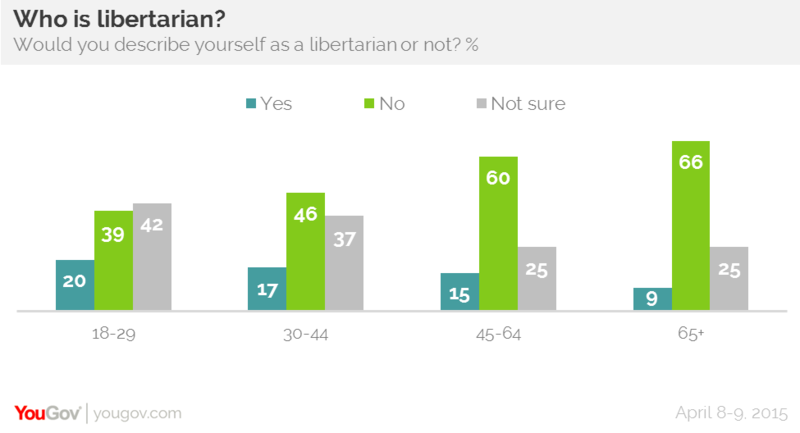 YouGov found that young Americans are more likely than any other age group to accept the label libertarian — great news for a growing political movement. And there is room for this figure to grow significantly as libertarian ideas spread, because, in addition to the 20% who self-identify as libertarians, another 42% said they were “not sure.” Only 39% rejected the label. Among older voters, 17% of 30- to 44-year-olds, 15% of 45- to 64-year-olds and 9% of those 65 and older say that the word “libertarian” described their views. But what is most remarkable about the YouGov poll is that it has found so many millions of voters who accept the libertarian “brand” as a label for their political views — something inconceivable just a few years ago. For more excellent commentary on the YouGov poll see “Millennials Are More Likely to Identify as Libertarians” by Robby Soave, Reason.com.